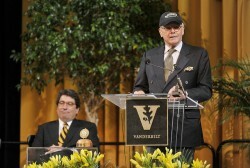 Journalist and author Tom Brokaw advised graduating seniors at Vanderbilt University to be mindful that everyone’s fate is more intertwined than ever in an age marked by technological advancement and class division. Brokaw urged graduates to “leave an indelible imprint on your time” by combining time spent on individual ambitions with work for the public good. 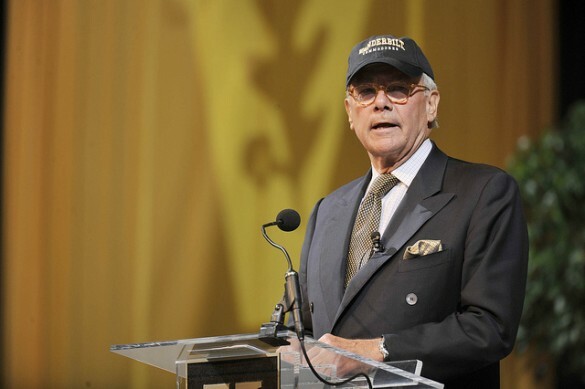 Noting that he probably wouldn’t have been admitted to Vanderbilt had he applied, Brokaw repeatedly invoked the small percentage of Americans who have served in combat in Afghanistan and Iraq while many citizens were relatively untouched by the wars. While the soldiers were away, “the rest of us at home went on a personal and governmental spending spree that took the American economy to the brink of a great depression,” he said. “Everybody blamed each other. “We were all in on it, and the only way out of it is together,” Brokaw said. He suggested public service academies along the lines of military academies, perhaps operated in partnership with private enterprise and offering job training in return for time spent serving less fortunate citizens. “Shoot for the stars and become the next ‘greatest generation,’” he said. The Nichols-Chancellor’s Medal was created and endowed by Vanderbilt Law School graduate Ed Nichols and his wife, Janice, in honor of Edward Carmack and Lucile Hamby Nichols. The medal is presented annually during Senior Day and carries a cash prize. Zeppos said that Brokaw is donating part of his Nichols-Chancellor’s Medal prize money to two charities, the Robin Hood Foundation, which addresses poverty in New York City, and City of Hope, which is devoted to biological research and education. “He represents the epitome of enlightenment through education,” Zeppos said of Brokaw.